This short commentary focus on two observations in two different dental conditions where neuropsychiatric diagnosis is needed. The permanent maxillary incisors are the two central incisors in the upper jaw and the two lateral incisors located between the central incisors and the canines in the upper jaw. All four maxillary incisors develop in the lower aspect of the frontonasal field of development. This field develops from cells migrating from the anterior part of the neural crest. This short commentary focus on two observations in two different dental conditions where neuropsychiatric diagnosis is needed. The permanent maxillary incisors are the two central incisors in the upper jaw and the two lateral incisors located between the central incisors and the canines in the upper jaw. All four maxillary incisors develop in the lower aspect of the frontonasal field of development. This field develops from cells migrating from the anterior part of the neural crest . The field extends from the sella turcica to the lower part of the frontal bone, to the midaxial part of the face and posteriorly including the septum nasii. In this short communication we will highlight 2 different kinds of tooth malformations within this field. Most publications on dental malformations in the frontonasal field are case reports and only few scientific publications are based on several cases. The purpose of this presentation of the dental conditions SMMCI and macrodontic maxillary incisors is to make neuropsychiatrists aware of an important correlation between dentistry and neuropsychiatry. The first example is the so called Solitary Median Maxillary Central Incisor, SMMCI. In this condition only one central incisor will develop (Figure 1). The prevalence is 1/50.000. The tooth is located exactly in the midline [1-7]. The mid-axilly, intermaxillary suture normally separating the two central incisors is absent in SMMCI. So is the frenulum labii superior. The morphology of the nose and the lip has special characteristics, and the interoccular distance is shorter than normal. Accordingly a mid-axillary tissue segment in the SMMCI-condition is missing. Cranial studies have demonstrated that the anterior cranial fossa is significantly shorter than normal, so is the nasal bone, and the anterior wall of the sella turcica has a deviant morphology [5,7-9]. Figure 1: Intra oral photo of the dentition from a girl aged 9 years. 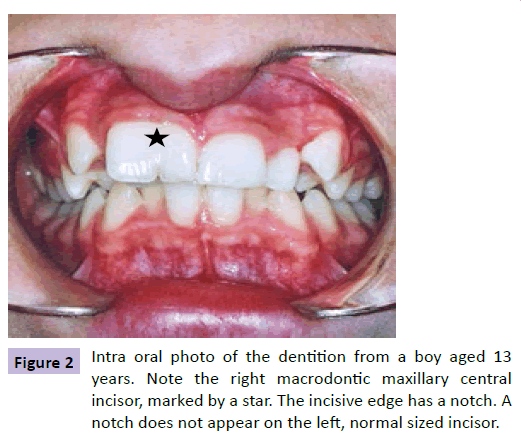 Note the solitary median maxillary central incisor, marked by a star. The lateral incisors appear normal on both sides of the central incisor. A MR-scan-study was performed of the brain of one child with SMMCI . The scan documented that the frontal hemispheres are not completely separated. It is well known that some children with SMMCI have been diagnosed with minor mental retardation, and their body height is below normal. It is also known that children with SMMCI have deviant neuropsychiatric disorders, but this aspect has seemingly not been described in detail. Macrodontic maxillary incisors (centrals as well as laterals) are extra wide incisors which have several designations, e.g. double teeth or connate teeth. They can appear unilateraly or bilateraly. How these wide incisors develop is not known. When the mesiodistal width of the crown of the permanent central maxillary incisor is larger than 10 mm for males and larger than 9.7 mm for females, the term macrodontia is applicable . 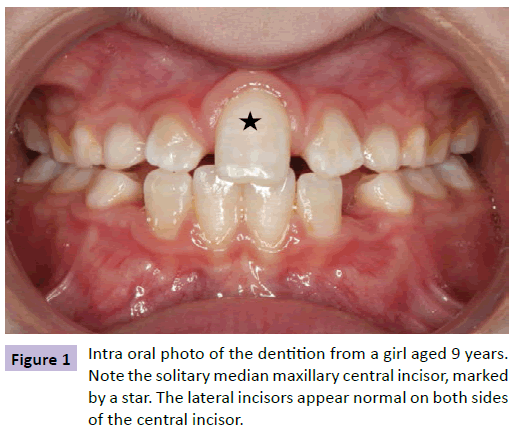 The prevalence of macrodontic central incisors is between 0.1 and 0.2% [11,12]. Gender differences demonstrate that the prevalence is higher for males . The macrodontic tooth appears with an enlarged crown, often with a bifid crown shape, sometimes with a notch on the incisal edge and a vertical ridge or depression on the facial surface [13-15]. The macrodontic incisor is often seen as an isolated feature not associated with syndromes. Still, macrodontia can also be a phenotypic trait in syndromes. The KBG Syndrome (named after the initial of the first three patients described) is one example of a syndromic occurrence where macrodontic incisors and mental retardation are part of the diagnosis. This syndrome was first described by Herrmann et al. . The characteristics for KBG is mild mental retardation, short stature, characteristic facies and macrodontia [16-18]. An example of macrodontia is demonstrated in Figure 2. Figure 2: Intra oral photo of the dentition from a boy aged 13 years. Note the right macrodontic maxillary central incisor, marked by a star. The incisive edge has a notch. A notch does not appear on the left, normal sized incisor. A recent paper by Kenrad, Christensen and Kjær demonstrates how the frontonasal field is enlarged in 21 patients with one or two macrodontic maxillary central incisors. The increment in bone dimensions is exemplified by enlargement of the length of the nasal bone, the length of the sella turcica, and the length of the anterior cranial fossa. Anamnestic information was not complete in all records. However in 11 records minor mental deviations were noticed ranging from problems with concentration, attending remedial class or special school, to specific psychiatric diagnoses in a few cases, e.g. attention deficit/hyperactivity disorder (ADHD) and deficit in attention, motor control and perception (DAMP). This information was mentioned in the paper by Kenrad et al. but not evaluated scientifically due to lack of exact neuropsychiatric diagnostics . This short commentary focuses on conditions in patients having interesting well known dental diagnoses but with unknown or not-exactly diagnosed neuropsychiatric diagnosis. The dental conditions mentioned are examples of how the morphology of the dentition and the underlying frontonasal bone segment are interrelated. Furthermore for the SMMCI condition a MR-scan of the brain has demonstrated abnormality in the development of the frontal lobes of the brain. We suggest that description of the maxillary incisors (Figures 1 and 2) is part of the future anamnestic information gained from the neuropsychiatric patient. This anamnestic addition could be to the benefit not only for diagnostics but also for treatment. Kjær I (1998)Neuro-osteology. Critical Reviews in Oral Biology and Medicine9:224-244. Scott DC (1958) Absence of upper central incisor. Br Dent J 104:247-248. Rappaport EB, Ulstrom RA, Gorlin RJ, Lucky AW, Colle E, et al. (1977) Solitary maxillary central incisor and short stature. J Pediatr 91:924-928. Hall RK, Bankier A, Aldred MJ, Kan K, Lucas JO, et al. (1997) Solitary median maxillary central incisor, short stature, choanal atresia/midnasal stenosis (SMMCI) syndrome. Oral Surg Oral Med Oral Pathol Oral RadiolEndod 84:651-662. Kjær I, Becktor KB,Lisson J, Gormsen C, Russell BG (2001) Face, palate and craniofacial morphology inpatients with a solitary median maxillary central incisor. European Journal of Orthodontics23:63-67. Kjær I, Wagner Aa, Thomsen LL, Holm K (2009) Brain malformation in Single Median Maxillary Central Incisor. Neuropediatrics40:280-283. Kjær I (2010) Orthodontics and foetal pathology: a personal view on craniofacial patterning. European Journal of Orthodontics 32:140-147. Becktor KB, Sverrild L, Pallisgaard C, Burhøj J, Kjaer I (2001) Eruption of the central incisor, the intermaxillary suture, and maxillary growth in patients with a single median maxillary central incisor, SMMCI. ActaOdontologicaScandinavica59:361-366. Tabatabaie F, Sonnesen L, Kjaer I (2008)Theneurocranial and craniofacial morphology in children with solitary median maxillary central incisor (SMMCI). Orthodontics & Craniofacial Research11:96-104. Moyers R E (1973) Handbook of orthodontics for the student and general practitioner (3rd ed.) Year Book Medical Publishers Inc, Chicago. Grahnén H, Granath LE (1961) Numerical variations in primary dentition and their correlation with the permanent dentition. Odontologisk Revy 12:348-357. Brook AD (1974) Dental anomalies of number, form and size: their prevalence in British schoolchildren.Journal of the International Association of Dentistry for Children 5:37-53. Pindborg JJ (1970) Pathology of the dental hard tissues. WB Saunders Company, Philadelphia. McDonald RE (1974) Dentistry for the child and adolescent. Mosby, St. Louis. Kenrad AB, Christensen IJ, Kjaer I (2012)Craniofacial morphology of the frontonasal segment in patients with one or two macrodontic maxillary central incisors. The European Journal of Orthodontics35:329-334. Herrmann J, Pallister PD, Tiddy W, Opitz JM (1975) The KBG syndrome – a syndrome of short stature, characteristic facies, mental retardation, macrodontia and skeletal anomalies. Birth Defects XI:7-18. Gorlin RJ, Cohen MM Jr, Levin LS (1990) Syndromes of the Head and Neck (3rded.) Oxford University Press, New York. Fryns JP, Haspeslagh M (1984) Mental retardation, short stature, minor skeletal abnormalities, craniofacial dysmorphism and macrodontia in two sisters and their mother. Another variant example of the KBG syndrome? Clin Genet 26:69-72.